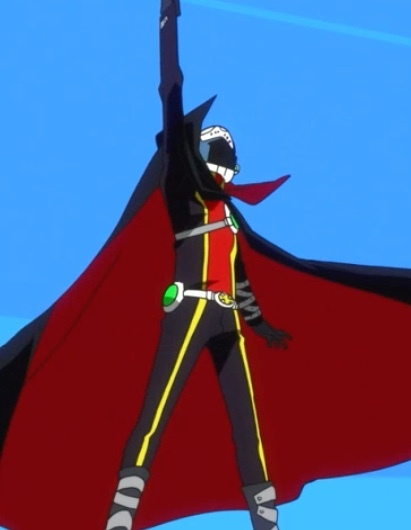 The eleventh episode of Concrete Revolutio, “Justice / Freedom / Peace,” features a character cutting the United States submarine Antares in half, lengthwise, with a sword. While he suspended the submarine in midair. By himself. Want to cosplay as Kiko Hoshino? You can buy her regular outfit at Amazon! A brown-haired young man runs past some fishermen discussing the new American submarine Antares. He leaps into the air, dons a white helmet, and jumps into the water. While submerged, he confronts the Antares. Meanwhile, Kikko Hoshino is embedded in the crowd waiting to see Angel Stars, the first superhuman band, as they perform for the dignitaries waiting to see the Antares. At the same time, Jirou Hitoyoshi and Emi Kino are talking to the representatives of Imperial Ads about their involvement in previous incidents, as well as their opposition to the Superhuman Bureau and superhumans. The representative corrects him, saying that they aren’t opposed to superhumans — only that the Superhuman Bureau applies the superhuman label to non-humans, which they find offensive. As they’re arguing, Hyouma Yoshimura arrives to take Hitoyoshi and Kino to the Antares‘ concert where trouble is brewing. Raito Shiba arrives at the concert and warns the crowd against a repeat of the incident with Judas. They retort that it was the police who caused the injuries. Interrupting the argument, Angel Stars introduce the surfacing Antares. Claude lifted the submarine in the air and was about to slice it in half in this shot. Capture from the Funimation stream. But, there’s something wrong with the sub. Its bow is crushed; a caped superhuman* drags it into the air and holds it there, suspended. Shiba recognizes him as “Claude.” The Angel Stars confront him and ask what he’s up to. Claude asks them if they “fight for justice, for peace, or for the freedom of mankind?” They answer justice and mention that peace is important, too. When they ask him to explain what he’s doing, he cuts the sub in half along its length. It falls to the dock a few hundred meters from the concert venue. Shiba and Hoshino rush to the scene. Shiba immediately calls him a villain, but Claude says he’s just a superhuman, and superhumans should not have to fight humans’ wars for them. Shiba, scornful of Claude’s words, attacks. Claude evades long enough to show everyone that inside the submarine are the tombs of many superhumans who were integrated into the sub’s systems. Hoshino is appalled; Shiba doesn’t care as long as he can arrest a villain. Claude, however, rips off Shiba’s arm after Shiba tries to power up. When Hoshino tries to intervene in her magical form, Claude has no trouble recognizing her. He declares that he won’t fight her because she’s one of the good superhumans. He escapes. Imperial Ads smuggled tape of the incident away from the scene and used their contacts to get it on the air. Yoshimura and Daishi Akita deduce that Claude’s aim was to expose the US military’s inhumane use of superhumans. Yoshimura’s upset because he saw that as the Superhuman Bureau’s job. As they are talking, Akita is summoned before his superior. Hoshino takes issue with Hitoyoshi calling Claude a demon, given that she’s a witch. Capture from the Funimation stream. Hitoyoshi is driving Hoshino to the hospital. They begin arguing about the merits of this case. Should the Superhuman Bureau have protected the superhumans integrated into the submarine? Hitoyoshi is clearly struggling to understand and articulate his feelings; Hoshino feels like he’s pushing her away because she’s a witch and demands that he pull over and let her out. He complies. Akita meets with his superior and unexpectedly sees two other men, one of whom is a prominent politician supporting the Superhuman Law. He’ll continue to do so, but only if the Superhuman Bureau can bring Claude to heel. Allowing Claude to become a folk hero would interfere with their plans. While Akita’s forced to agree to a deal he clearly hates, Shiba is undergoing repairs at the hands of the Sciencers. He asks for their help to identify Claude. Hoshino receives a tip to go alone to meet Claude. She arrives at the abandoned facility and finds medical staff slaughtered and Claude injured. The sight overwhelms her. Claude, strangely, seems to be surprised to see her. To relieve her shock, she consumes a root from her purse despite Ullr and Claude’s protests. It releases her true form, which Claude recognizes her as the future queen of the demon realm; she demands he explain himself. He answered that he had to oppose evil in any form. Accepting his explanation, she releases him. As she begins to phase back to the “normal” Hoshino, she asks if she knows him. 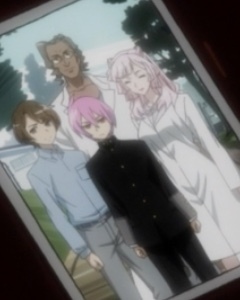 He shows her a picture: Hitoyoshi as a child with his pink hair; Kino, looking just as she does now; Hitoyoshi’s adopted father; and a child, a little older than Hitoyoshi, with brown hair. “I knew it,” she said as she collapsed. 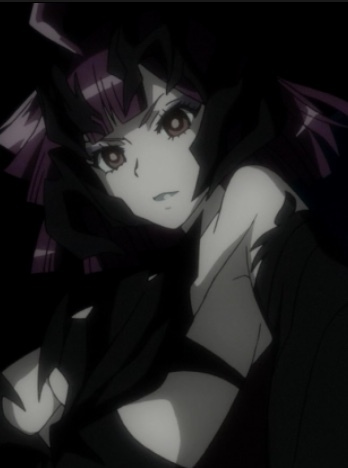 Hoshino in her demon queen form brimmed with regal confidence. Capture from the Funimation stream. Hoshino continues to try to get between Hitoyoshi and Kino, but she’s so innocent that it’s just about impossible. Claude maintains his integrity as a superhuman with his own agenda. He won’t bow to Shiba, and he won’t bow to the Japanese or American governments. I can see the pressure ratcheting up on Hitoyoshi. He started a little unsure of the Superhuman Bureau and his role in it. By the time Hoshino asked him to pull over and let her out, I could sense his resolve wavering. When Hoshino transforms into imperial badass mode, she’s seriously intimidating. Seriously attractive, too! In a “don’t eff with me” sort of way. Ullr switches from bossy little guy to complete subservience instantly at the sight of the future demon queen. Nothing forced me to wince this episode. After seeing the photo in the closing shot, three of things jumped out at me. Capture from the Funimation stream. First, the young Jirou’s hair is the same color as Kino’s. And she looks the same age back then as she does in the show’s “present.” Why is that? Second, the young man on the left has the same color hair as Claude. I don’t believe in coincidence, so I have to guess he’s either Jirou’s adopted brother or another adoptee. So, why doesn’t Jirou remember him? Or would he if he saw Claude’s face? Third, how the heck does Hoshino know Claude? I’ve not seen her interact with the young version of Jirou; it seems like the first time she met him was in episode 1. I wonder if she gains additional memories when she becomes the demon queen? So many questions! So many days before the next episode! 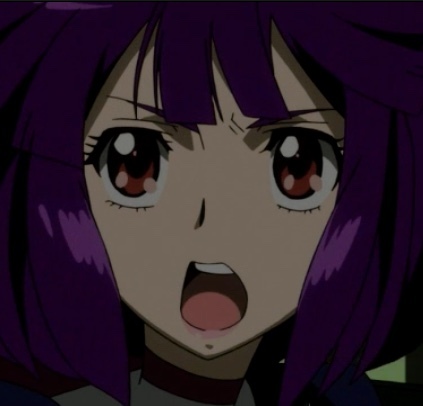 By the way, in case you’re interested on another perspective on Concrete Revolutio, I came across a post by Guy over at Geekorner-Geekulture. It looks like they’ve put a lot of work into their timeline. Well worth a read! * I wonder what Edna Mode would say (YouTube clip)? Dimension W Episode 8: Told You They Needed an SUV!